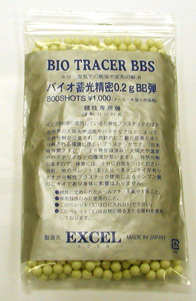 Fight for your environment and leave less impact for the sport of Airsoft, with the accuracy of Excel BBs! FOR USE WITH TRACER UNITS, GLOWS GREEN! Mix with normal BBs for a true tracer experience!